… and not only that, it’s the 40th anniversary of the first “Earth Day.” Shall we reflect? Yes, let’s shall. My career as a geoscientist was largely inspired by desire to spend time outside, and that in turn was inspired by a lot of positive outdoor experiences as a child and young man. I feel at peace and satisfied when I am spending time in natural landscapes, most particularly mountainous landscapes. The more time I spend thinking about the Earth system, its dynamics and history, the more chagrined I become at my own species’ destructive habits. On the whole, I think it’s fair to say that we trash the planet wherever we go. We clear out naturally-occurring biota, and replace it with shelters and infrastructure for ourselves. We hike trails in the woods for recreation, and Hansel-like, mark our way with candy wrappers, tissues, and cigarette butts. The more I have learned what a non-human-influenced Earth system looks like, the more disgusted I get at the human fingerprint. My environmentalism is strongly influenced by my geologic awareness. Of course, there are the bigger issues than litter and housing developments, like our agriculture-facilitated denudation of the landscape, our chemically-facilitated erosion of the ultraviolet-screening layer of our atmosphere, and the CO2-facilitated warming of the planet’s average temperature. All of which have profound consequences not only for our neighbor species, but for ourselves. Without soil, ozone, or our coastal settlements, we’re increasingly screwed. We humans excel at shooting ourselves in the feet. That point is the one that’s mostly likely to touch home with people: knowing our own selfishness, we environmentalists often ask our neighbors to adopt our views because it is in their own self-interest. We couch our activism in the language of harm to people, but I’ll admit that’s besides the point for me. I rank other species as inherently of value, in and of themselves, regardless of their benefit to humanity. I’ll admit that I have no scientific evidence to support this claim — it’s one of the few genuine “beliefs” that I hold. I believe other species deserve to exist, unmolested by us. The elephant in the savanna is threatened by the elephant in the room: overpopulation of Homo sapiens. This morning, the world has 6.8 billion people on it, and tomorrow there will be even more. The rate of population growth is increasing at the same time that the resource consumption per individual is also increasing. The impact on the planet is astonishing. Life finds a way to adapt to our presence only in a general sense. The specifics, the particulars are being rubbed out. For ever individual pigeon or rat we gain, we lose a golden toad or an ivory-billed woodpecker. If the current rate of species extinction is perpetuated, then we are living through the start of the sixth great mass extinction of the Phanerozoic. This broad view I take, where humans are not the pinnacle of anything, but something more akin to a cancer on the planet, is a grim one. When new medical treatments are announced, to the fanfare that they will extend human life, and prevent more people from dying, I wince a little. Longer lives are (probably) good for the ones living them, but a longer legacy of consumption makes things rougher for everyone and everything else. It’s the tragedy of the commons, written in lives. The planet Earth would be a better place if there were fewer people on it. In no way do I advocate action to remove people from the planet — my sense of environmental duty does not trump my sense of ethics — but I can’t deny that I would prefer to live on a planet with only 1 billion people than the current crowd. This is a conundrum: I value the coherent functioning of the Earth system, but I also value individual human lives. I suppose the best thing you could do for the planet would be to kill yourself. Yet I find the experience of being alive so sweet: I couldn’t possibly give up that experience just for the sake of making the planet’s problems 1/6800000000th better. Where does this leave me? Confused, perhaps. Hypocritical, maybe. It’s a tough spot to be in. One thing that I’ve decided is that I don’t want to bring any more humans into the system. I have made an ethical decision that I can prevent a small piece of that overpopulation by refusing to procreate myself. I’m surrounded by people spawning huge numbers of kids, and I find it distasteful. My brother, for instance, has four children. Though I love each and every one of them, I can’t deny that I’m taken aback by my brother’s profligacy every time my nieces and nephews swarm around me. Another thing I’ve decided is to try and make my time here a net positive, rather than a net negative. Yes, I consume, but then I try to use that consumption as fuel for the education of my planetary peers. I teach, I blog, I discuss. I’m not sure that this is a success, but I don’t know what else to do. The modern Earth Day encourages us to “be green,” one of the shallowest and least thoughtful phrases ever to be willingly adopted by the environmental movement. Along with this single ill-defined word (“green,” the color of envy and seasickness), comes a marketing campaign which is focused more on consumption than on sustainability. “Green” is a buzzword, a fad. It’s time in the spotlight is fading, as far as I can tell. A deeper sense of ecology is needed, something that can’t be summed up by a single phrase or a single color. We live on a finite object, a lone oasis in an incomprehensibly enormous inhospitable void. It astonishes me that we slap a coat of “green” on our unsustainable existence and think that makes a damn bit of difference. Because the Earth is larger than individual humans, we have a rough time conceding that it is finite. But “big” and “infinite” are not synonyms; we cannot long act as if they are. I find my outlook for the Earth’s biosphere to be a grim one. A robust biosphere is incompatible with human society’s resource-consuming, habitat-altering, Earth-system-perturbing ways. I wish I could say I was hopeful that we would get it figured out, but I’m not. We are neck-deep in evidence that our lifestyles are unsustainable, but we persist regardless. Our selfishness takes priority over our moral duty, and that seems to be human nature. As long as humans are part of the system, I can’t see how the average human impulse for comfort, security, and reproduction won’t continue to put our neighbor species at a profound disadvantage. 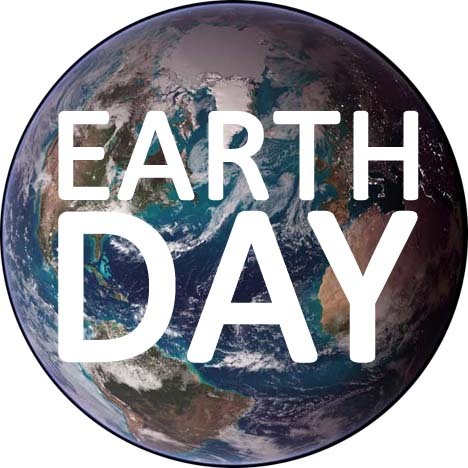 So here’s what I plan to do this Earth Day: I’m going to learn a bit more about the Earth, and I’m going to teach a bit more about the Earth, and I’ll appreciate the day as one among an almost infinite number of rotations of this fine orb as it orbits our fine star. I’m not going to be “green,” I’m going to encourage a fuller understanding of our role in the terrestrial flow of matter and energy. I’ll feel lucky to be here today, and hope that I still feel that way 40 years from now. How will you spend your day? How will you spend your time on this planet?